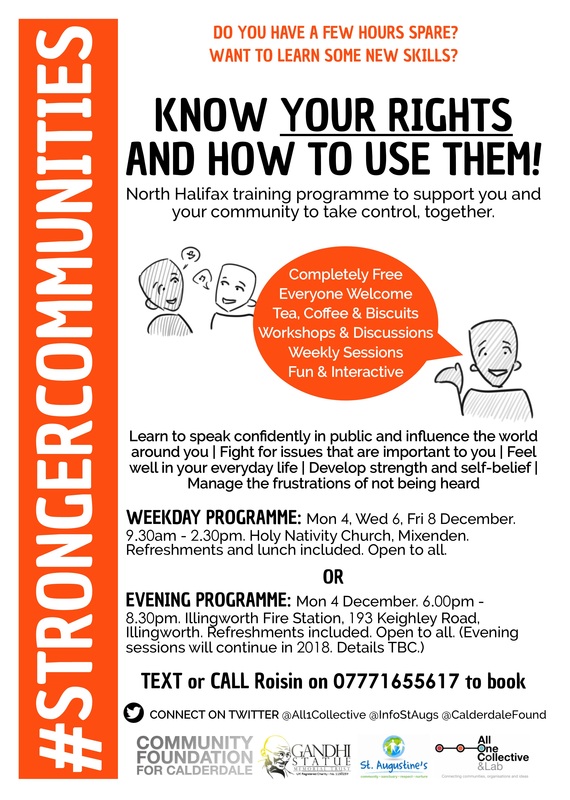 A FREE Training Programme Open To All in the Mixenden and Illingworth area on – Know Your Rights! And How To Use Them. To learn some new skills, go to one of the Community Skills Training groups in North Halifax. Text or call Roisin (*Row-sheen*) on 07771655617 for more information and to confirm a place. Pick one of the two programmes below and then get ready to learn skills which will make you feel stronger every day. No previous experience is necessary, and everyone is welcome. Come ready to gain confidence and learn to solve problems in your community, with your community. WEEKDAY PROGRAMME: Monday 4, Wednesday 6, Friday 8 December 2017, 9.30am till 2.30pm. Holy Nativity Church, Mixenden. Refreshments and lunch included. Open to all. Part of Stronger Communities project. Delivered in partnership between All One Collective & Lab and St Augustine’s Centre, Stronger Communities aims to empower and connect people. Funded by Community Foundation for Calderdale and Gandhi Statue Memorial Trust. ← North and East Halifax Friday Flyer 24 November – OUT NOW! !